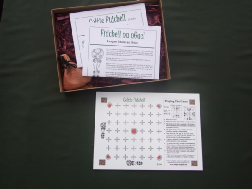 Celtic Fidchell was the thinking mans strategy board game of choice in Ireland when Cuchulainn was a boy and is referred to frequently in the Celtic manuscripts and Legends where it is described as being played by royalty and even the Gods. The game was invented by Lugh, the God of Light, and played with skill by his son, the warrior Cuchulainn. Scholars agree that this board type lends itself to the playing of a Tafl or Tablut style game, variations of which were widely played throughout Northern Europe and Scandinavia at this time. Others argue that Fidchell was more like the Roman game of Latrinculi, but while there is an element of speculation as to the precise rules of Fidchell we can be certain that the Ballinderry style board was played in Ireland over a thousand years ago. THIS IS A GREAT BOARD GAME, WITH CONNECTIONS TO IRELAND DATING BACK OVER A THOUSAND YEARS. THIS STYLE OF BOARD GAME WAS PLAYED ALL OVER NORTHERN EUROPE UP TO THE 13TH. CENTURY. MY GAME IS BASED ON THE BALLINDERRY BOARD WITH SETUP AND RULES OPTIMISED TO PROVIDE A CHALLENGING AND EXCITING GAME FOR PLAYERS OF ALL SKILL LEVELS.